Thanks to Stevie everyone gets to know me a bit better. Find my answers to her questions below. All my life I had all these dreams and things that I wanted to do, writing being one of them, but somehow in the life that I had set up it didn’t ‘’fit’’. Left and right all I heard was when you finish X, Y an Z you can go do those things. It felt like such an injustice, the question of why I couldn’t live those dreams today kept creeping up in my head. The day that I decided to ‘’rebel’’ and realize at least one of those dreams made me realize that waiting is a mistake. Today is the day to realize all my dreams, I had gotten so many warning signs that tomorrow is a luxury and not a promise it was about time I started living like it. The feeling I got when I chose me and the path that felt 10000% right on the inside is one that I knew I had to share in hope to diminish the number of people who are not marching to the beat of their own heart. 2. Where is your blogging ‘’zone’’? I don’t really have a blogging ‘’zone’’ as I travel a lot. 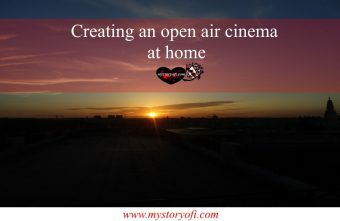 I can write anywhere, I do find that I am most inspired to write when it is dark outside. AM writing really is a thing for me. Also, I always carry a notebook with me. Yes I am that girl that has a million notebooks in all different sizes. In my defense they all serve a purpose! Really!! 3. How do you organize your posts? I am a major planner. It gives me anxiety to not know what will be happening next. I know a month in advance what all I want to discuss on the blog and make sure that most of it is written before the start of that month. Except the wonderlogues because that has become my online diary which I write every Saturday morning. 4. What skill would you like to learn? My favorite beverage is a Apple Juice and my favorite alcoholic beverage is an Apple Martini. There is a trend here! I listen to a variety of music. It really depends on my mood. The songs I enjoy the most are songs that actually have sensible lyrics. Usually the mix consists of love songs (mostly), Latin songs and Vivaldi. 7. If you could collaborate with anyone, brand/blogger etc, who would it be? I would love to collaborate with bloggers and brands who are advocates for better mental health and/or travelers. Paperchase as well, I love their notebooks! Last but definitely not least with travel companies & hotels. 8. If you could travel anywhere, where would it be? This is a tough question for me because ideally I want to see every centimeter of this earth. There isn’t a place that I would skip. The world is such a beautiful place and I want to see it all. When asking me where would I go if I could travel anywhere my answer is everywhere. My favorite book is ‘’The Catcher in The Rye’’ by J.D. Salinger. I had to read this book for English class in school and my god was it a struggle. It took me basically the entire school year to finish it just because of the way it is written, but when I got to the end suddenly it all made sense and I had this big AHA moment. Which resulted in me absolutely loving the book and totally understanding why it is a classic. 10. Board games, computer games, or both? I have not played many board games in my life and have never really played a computer game. I totally skipped this phase in life I just realized. Having to choose I would say board games as I think this fits my lifestyle better. I am hardly ever on my computer if I am not writing for the blog. Life is to be lived outside in the real world, gaining experiences and what I’ve heard playing monopoly can be a real unforgettable experience. 11. Blogging advice to new bloggers? Follow the beat of your own heart. First and foremost do it because you love it and because you want to do it. Write about things that you love writing about. Also there is no special formula in how blogging is supposed to be. Everyone has their own path to walk, as long as it all feels right on the inside keep going. Why do you blog about your specific topic? 2. What is your best life advice? 3. What is the best advice you have ever gotten from someone else? 4. What is a lifehack you can’t live without anymore? 6. What do you do to cheer yourself up when you’re feeling down? 7. To live by the beach, city or in a small town? 8. What is your ideal day? 9. How do you keep yourself motivated to keep blogging? 10. What food can someone wake you up for in the middle of the night? 11. What blog post are you most proud of? 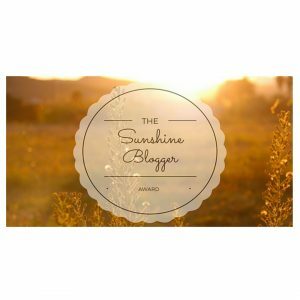 Once again thank you for the Sunshine Blogger Award nomination. I, for one, am very much looking forward to the answers of my nominees.